Good read and quite informative. Well written article !!! 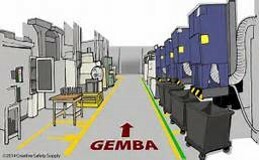 To the point of what A Gemba is and how it relates to everyone's operations. First and foremost walking the Gemba is a learning opportunity for the walker. It's an opportunity to see reality as it truly exist vs. what you perceive (your assumptions). Once the walker is in touch with reality and has set aside her or his assumptions, then you can begin to help others do the same. A key challenge is learning to see, it is quite difficult to let go of your assumptions, whether you are a first line supervisor or an outside executive.